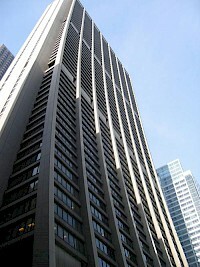 Chase Tower, located in the Chicago Loop area of Chicago at 10 South Dearborn Street, is a 60 story skyscraper completed in 1969. At 850 feet (259 m) tall, it is the tenth tallest building in Chicago, the tallest building inside the Chicago 'L' Loop elevated tracks, and the 32nd tallest in the United States. Design architects for the construction were C.F. 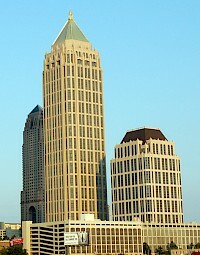 Murphy Associates and Perkins and Will. The building has the headquarters of Exelon. 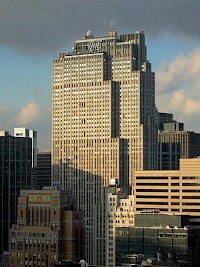 The GE Building is an Art Deco skyscraper that forms the centerpiece of Rockefeller Center in the midtown Manhattan section of New York City. Known as the RCA Building until 1988, it is most famous for housing the headquarters of the television network NBC. At 850 feet (259 m) tall, the 70-story building is the 9th tallest building in New York City and the 32nd tallest in the United States. Its address is 30 Rockefeller Plaza.